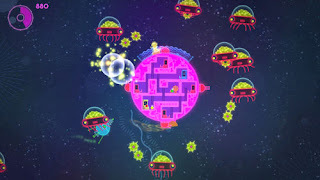 Lovers in a Dangerous Spacetime, from developer Asteroid Base, is an odd little 2P co-op experience that places players in a pink space station facing off against an onslaught of invaders. Players run around the inside of the station, manning various control panels to operate turrets and lasers to destroy the attacking ships, using shields to defend the station, and activating thrusters to push it away from danger, frantically dashing from one control panel to the next as the situation outside the station changes. The game is headed to PC, Mac, and Linux via Steam, and Xbox One via XBLA on September 9.